Rucker, a bassist, cellist, and composer of impressive ambition, capability, and intelligence, has been demonstrating over the last several months that Seattle was a fortunate choice. The rain and the hills clearly agree with him, judging by the two recordings he released last year on his own Jackson Street Records which, he has shown, is capable of releasing assured, and well-produced music from a basement equipped with only a Macintosh G3 and a very modest array of attached hardware and software. His two releases, History of an Apology and Oil, seem likely to be only the first of many outstanding projects from Rucker, now in his mid-30s, and in town from his native South Carolina for six years. Apology and Oil demonstrate that he has succeeded in dazzling fashion. They are all the more remarkable given that they are his first full-fledged jazz projects. He began creating his own music and privately recording it when he was 15, but Anderson, South Carolina, had no recording studios, so until he managed to cut a few tracks while at the University of South Carolina, in Columbia, he had to content himself with taping at home. When he moved out here, he at first kept to himself. In fact, he also was taking a two-year break from playing. But he began preparing for his current releases almost immediately, by listening as widely as he could, and getting to know musicians whose work appealed to him. In 1998, at the Baltic Room one day, he met Bill Frisell and gave him a copy of some of his music — and found him both far more approachable and far less intimidating than he had expected from Frisell’s own sometimes dark, often intense music. That encounter bears fruit on Apology: Frisell contributes a fine, searing solo. Rucker also met trombone icon Julian Priester, who also appears on Apology, as well as other local luminaries. And he slowly built his base. On each of the History of an Apology’s carefully constructed and layered tracks, Rucker has relied on a core group of fine Seattle players, including saxophonist Hans Teuber, who is as dependable a collaborator as any in the city. Rucker’s ambition requires highly accomplished players who are ready and able to contribute to the fine details that make all the difference in bringing to life the themes of the album. The album, which appeared last April, responds to the infamous Tuskegee Experiment in which, between 1932 and 1972, the U.S. Public Health Service conducted a heinous experiment on 600 African American men, 399 in the late stages of syphilis, and 201 in a control group. The men who were infected with the disease, most of them illiterate sharecroppers in Alabama, were left untreated so that researchers could monitor the gruesome course of their disease. The variety of instrumentation is sonically rich, attention-catching, and above all expressive. Among other Northwest-based players heard on Rucker’s eight compositions are guitarist Bill Horist; trumpeter Jay Roulston (“wow!” Rucker says of him); accordionist Amy Denio; trombonists Jeff Hay and Neil Gitkind; percussionists Jeff Busch and Erik Anderson; flutist Isaac Marshall; electric bassist Farko Dosumov; piercingly plaintive vocalists Flora McGill and Josephine Howell; drummer Jacques Willis; and conga player Elizabeth Pupo-Walker, whose time, variety, and feel have become acclaimed all around town. Then came guest soloists whom Rucker selected for a variety of well-calculated expressive effects, including Bill Frisell on the title track, and Julian Priester. Another legend, Michael White, contributes his highly seasoned violin to a few pieces. Jovino Santos Neto solos most effectively on the little-used melodica. The ensemble creates pieces that are often somber and pained, yet also austerely dignified and resolute. The music’s exact references to the shameful Tuskegee incident are not directly apparent, yet the album runs deep with a complex sense of delving into a terrible, mournful history. Apology is, then, far from a recitation of standard jazz forms; it is carefully considered and beautifully conveyed. And there was a lot of work. Rucker spent two years getting the recording together, working on ideas, getting studio time, and obtaining some funding through a grant from what was then the King County Arts Commission. Of course, having Hans Teuber, the city’s ultimate jazz professional, on board, helped all the way. Rucker’s acquaintance with him goes back to his college days in South Carolina, where he studied composition with Teuber’s father. The reach and intensity of Rucker and Teuber’s musical communication is apparent on the second Jackson Street Records release of last year, Oil, a set of nine outstanding improvised pieces with Rucker on cello and Teuber on alto saxophone. Teuber has access to both the conventions of jazz and a vault of expressions of his own heart and mind. Rucker is right there with him. Captivatingly oblique and sonically free, they sound out the raw edges of conventional sonorities amid moments of simple, plain statement. The album opens, for example, with a spare, thoughtful, gentle, deeply felt piece that displays, like Apology, Rucker’s winning assurance. In that, Teuber ably collaborates. Neither musician is interested in indulging in anything flashy; rather, their contributions are exploratory, searching quietly for pockets of wonder in each other’s reactions. The result is a compelling album that meanders into spaces of transporting strangeness. Not too many musicians who are capable of such aesthetic subtlety are able to then turn around and take care of the business end of the business. But Rucker is giving notice that he can. With Jackson Street Records, he pursues a self-help approach, tirelessly advocating for the work that he and his small stable of fellow musicians publish. “This is a one-person operation,” he notes, as he shows his space, which is in an artists’ coop that he helped set up. One side of his basement studio is packed with his several stringed instruments — basses, guitars, cello, and assorted others. His recording and production equipment is along the other wall. There’s barely room for the only other essential — a bed. No point in paying two rents; that’s a tenet of the scrabbling jazz life. Upstairs, in a second space that he shares with a graphic artist, Rucker says: “The rest of it is just me in this room here, sending out things.” In the cramped quarters, he manages to maintain enough order that he can efficiently dispatch a hundred promotional packets or more each month, as far afield as the Netherlands, Spain, Austria, all over. Jackson Street’s website (jacksonstreetrecords.com) is drawing fan mail from as far away as Manchester and Macedonia. A couple of friends helped Rucker design the site, along with his album covers, although Rucker has plenty of design skills, himself, and is in fact an accomplished visual artist, too. Internet sales of Apology and Oil are going well, aided in part by some airplay over local radio stations with internet broadcasts. With any luck, they’ll increase this year if he can organize a tour to Canadian jazz festivals, and hopefully to locations in Europe. Resourcefulness is a quality that Rucker traces to the musician who would appear to be at least as much his inspiration as any other — about whom, at least, he waxes warmly: his mother. As he grew up in South Carolina, she taught herself to play the organ through mail-order courses from something called the US School of Music (which still exists). “A lesson a week,” Rucker says. His mother slowly, doggedly learned pieces, and then, in 1979, held a recital at her church. “It was on a stage built especially, and there were flowers all around,” he recalls. He was 9, and clearly the event made an impression on him. At about that time, he was beginning to learn bass at his public school; he continued lessons all through high school. He played his first paid gig at 13: a local theater production of Man of La Mancha. “It was very difficult because of the mixed meters,” he remembers. When he was in the 11th grade, Rucker got to know Chris Potter, the stellar saxophonist now with Dave Holland’s quintet. Potter was then in 8th grade, and the two played together in an all-state jazz band. (“He played my first, early arrangements, of pop music,” says Rucker.) Also in the band was Ronald Westray, who went on to the Lincoln Center Jazz Orchestra, Wynton Marsalis’s band, and related outfits. Rucker stayed close to home for college because his father, a coal miner in Virginia, had developed cancer, which he survived for three years. Attending the university in Columbia had an upside. He met Hans Teuber, who was playing all around the city. 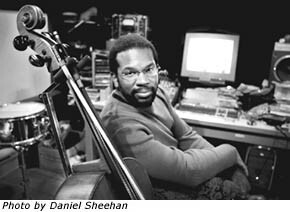 In 1994, he played piccolo bass, electric bass, and sang on a rock recording with drummer John Blackwell, who is now with Prince. He was gaining a profound, broad grasp of music, he was rehearsing every day, and traveling out of town. “I was playing too much,” he admits. Burnout hit in 1998. He stopped playing altogether. But by then he had set his course for Seattle, where his musical quest would revive. Thank goodness someone is saying it out loud. A weird thing about Seattle jazz is that most musicians don’t want to publicize how little they make, for fear that some club owner will realize that they could get away with paying even less than they do. So, he plays live shows rarely, perhaps just four or five a year, including occasionally accompanying silent movies with his free-improv quartet, which includes trombonist Neil Gitkind. But he does have a business plan, which involves “keeping expenses down, and selling steadily,” as well as getting the word out to as much of the world as he can contact in the age of the Internet. Also in the plans is a project with string quartet and jazz quartet, and an anthology of music that he has created over the last 20 years, beginning at age 15.